Domestic terrorism involves groups or individuals who are based and operate entirely within the United States or its territories without foreign direction and whose acts are directed at elements of the U.S. Government or population. 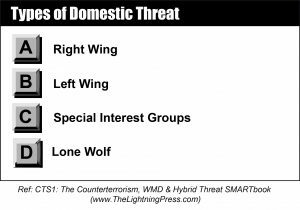 Domestic terrorist groups can represent right wing, left wing, or special interest orientations. Their causes generally spring from issues relating to American political and social concerns. Right wing terrorist groups often adhere to the principles of racial supremacy and embrace antigovernment, antiregulatory beliefs. Generally, extremist right-wing groups engage in activity that is protected by constitutional guarantees of free speech and assembly. During the 1990s, right-wing extremists filed hundreds of groundless liens and other legal claims that clogged courts, disrupted the execution of legitimate civil proceedings, and, on many occasions, resulted in real financial loss to victimized individuals who had to defend against these illicit actions. • Often adhere to conservative or reactionary principles. • Such groups endorse racial supremacy, and / or embrace antigovernment and antiregulatory beliefs. • Patriot movements, militias and “common-law” groups. • Example terrorist groups: Ku Klux Klan, Neo-Nazis, Skinheads, Christian Identify, Black Separatist, Aryan Nation, World Church of the Creator (WCOTC), Posse Comitatus and other religious hate groups. Left wing groups generally profess a revolutionary socialist doctrine and view themselves as protectors of the people against the dehumanizing effects of capitalism and imperialism. They aim to bring about change in the United States and believe this change can be realized through revolution rather than through the established political process. From the 1960s to the 1980s, leftist-oriented extremist groups posed the most serious domestic terrorist threat to the United States. In the 1980s, however, the fortunes of the leftist movement declined dramatically as law enforcement dismantled the infrastructure of many of these groups, and as the fall of Communism in Eastern Europe deprived the movement of its ideological foundation and patronage. • Profess a revolutionary socialist doctrine and view themselves as protectors of the people against the “dehumanizing effects” of capitalism and imperialism. • They are responsible for bombings, assassinations, robberies and planned attacks on infrastructure targets. • The Cold War appeared to be a culminating point for the left-wing terrorist groups as the organization dissipated by losing their patronage and financial support. Special interest terrorism differs from traditional right wing and left-wing terrorism in that extremist special interest groups seek to influence specific issues, rather than effect widespread political change. Special interest extremists conduct acts of politically motivated violence to force segments of society, including the general public, to change attitudes about issues considered important to their causes. The increasing level of violent and threatening activity perpetrated by extremists within the animal rights and environmental movements, in particular, appears to be increasing, not only in the United States, but also in Canada and especially throughout Europe. • Extreme groups who seek to resolve specific issues, rather than affect more widespread political change. • These groups occupy the extreme fringes of animal rights, pro-life, environmental, anti-nuclear and other political and social movements. • Tactics range from spray-paint vandalizing to fire-bombings. • Examples organizations: Animal Liberation Front (ALF) and Earth Liberation Front (ELF) are considered Eco-terrorists. Lone wolf terrorism is shown to be more prevalent in the United States than in the other countries under study. The cross-national analysis suggests that in the United States lone wolf terrorism has increased markedly during the past three decades; a similar increase does not appear to have occurred in the other countries under study. The numbers of casualties resulting from lone wolf terrorism have been relatively limited, and there is no evidence that the lethality of lone wolf terrorism is on the increase. The rates of psychological disturbance and social ineptitude are found to be relatively high among lone wolf terrorists. Lone wolf terrorists tend to create their own ideologies that combine personal frustrations and aversion with broader political, social, or religious aims. In this process, many lone wolf terrorists draw on the communities of belief and ideologies of validation generated and transmitted by extremist movements. • Lone individuals have their own motivations and agenda. • They are not supported by group activities, but may draw a few coconspirators in with them or ideological principles. • McVeigh’s retaliation motive (for the FBI assault on Ruby Ridge and ATF assault at Waco) led him to believe that bombing federal buildings prevented the government from continuing with its work. • Eric Robert Rudolph seemingly targeted abortionists and homosexuals. He believed that by carrying out his attacks, he could influence the government to change laws and policy.